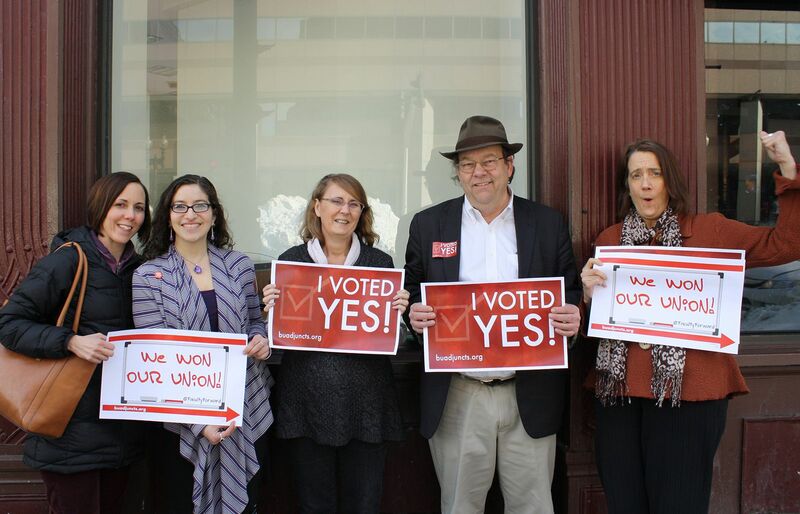 As part of a yearlong campaign that has brought part-time faculty unions to several universities in Massachusetts, Boston University adjunct faculty voted Wednesday to join the Service Employees International Union Local 509. With the 319-158 vote held by the National Labor Relations Board, more than 750 adjunct professors will unionize, advocating for better standards and improved stability, according to a Wednesday press release. Adjunct professors make up 41 percent of BU’s faculty, Hunter said. The NLRB sent mail-in ballots to faculty members Jan. 13, allowing them to cast their votes in the election, The Daily Free Press reported. The union will work to negotiate with the university over issues such as payroll, office space, longer contracts, job security and health benefits for the adjunct professors, Hunter said. 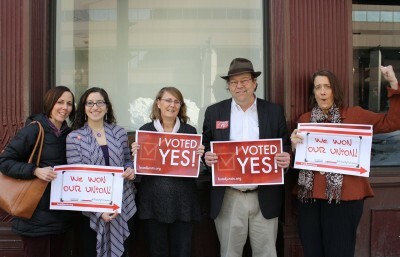 BU spokesman Colin Riley said the university looks forward to working with the adjunct union moving forward. By becoming a part of SEIU Local 509, BU’s adjuncts join the faculties of Tufts University, Lesley University and Northeastern University, where individual union contract negotiations are in the process of being made, the release stated. Laurie LaPorte, an anthropology lecturer in CAS, said she has been working on the unionization campaign for eight months. “I’m feeling pretty elated … listening to the stories of our adjunct colleagues and to have seen such an overwhelming turnout, we’re feeling pretty good about the outreach that we’ve done,” she said. LaPorte said she looks forward to discussing different issues with the adjunct faculty, whether or not they voted in support of unionization. “It feels very satisfying to be able to report back to the adjuncts with whom I’ve spoken that, ‘Yes, we are working toward actually having a voice for you to bring out your concerns and your issues and to work with the university administration on addressing those concerns,’” she said. Gary Duehr, an adjunct professor in the College of Communication, said he is extremely pleased with the results and that the decision to unionize was a clear one. Duehr said Tufts served as an example of how adjuncts should successfully unionize and negotiate multi-year contracts. “That’s kind of really beyond my imagination that something can even happen like that,” he said. Several students said they are in support of the adjunct unionization. “Some of those professors bring a lot of unique experiences from different sectors, and they can only accommodate a part time schedule, and I think they really add to our educational experience, so we want to keep them happy too,” said Collette O’Connor, a freshman in the Sargent College of Health and Rehabilitation Sciences. Justin Nadler, a freshman in the School of Management, said he was surprised to hear that adjunct faculty had only unionized now. “I feel like that would have been something they did a long time ago, if it improved their job conditions,” he said. Alina Szremski, a sophomore in CAS, said spreading awareness about the working conditions of adjunct professors is important. “It’s kind of crazy that students pay so much tuition, and President [Robert] Brown makes over a million dollars a year, and then we can’t pay our adjuncts enough for them to live comfortably,” she said. Hunter said the key to having a strong faculty is including all of its members. Democracy is nothing more than two wolves and a sheep deciding what to have for dinner. Suffolk University had this union before BU and it has done nothing to benefit the adjuncts there so I expect it will do nothing here either; other than to perhaps create a perpetual line in the sand that fosters animosity. Universities have long been known for being sweat shops where adjuncts toil long hours and tenured faculty with stellar publication records and histories of well funded research prosper unfairly (sarcasm intended). Now that the majority has spoken for the minority I am sure we will “all” be better off living under the latest incarnation of the oppressive force of mob rule euphemistically disguised as “democracy” even if the minority does not know it. I am sure that in the long run any perceived gains made by the “majority” will likely only serve to have the unintended consequence of holding the best lectures among all of the adjuncts back as limited resources are redirected to meeting the demands of the majority. Correction: Suffolk University is represented by the American Association of University Professors (AAUP), not SEIU Local 509.